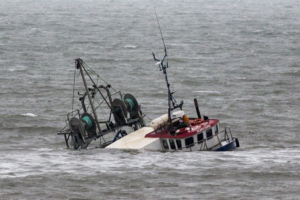 The fishing vessel Atlantic Osprey ran aground and sank off Balbriggan in north Dublin, Ireland. The wooden vessel with five crew on board was fishing razor clams, but lost power and remain adrift in stiff breeze. 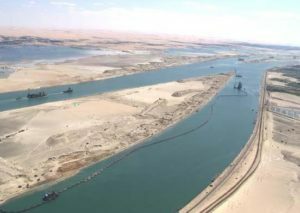 The crew was unable to restart the engine and vessel stuck into a sandbank. The grounding water breaches of the wooden hull and fishing vessel Atlantic Osprey started getting water ingress. The fishermen sent distress signal to the local authorities and requested immediate evacuation. The weather conditions at the time were described as overcast with a south easterly Force 3-4 wind blowing and there was immediate danger for the life of the people. The UK Coast Guard dispatched rescue helicopter and RNLI boat to rescue the five fishermen. “Efforts are now underway to salvage the trawler”, said a Coast Guard spokesman. “The crew despite the ordeal are reported to be in good spirits”, added he. At the scene of the accident first arrived the Skerries RNLI boat, which tried to refloat the troubled fishing vessel Atlantic Osprey, but attempts failed. During Salvage attempts on board of the fishing ship were transferred three pumps, but despite of crews’ efforts, the pumps couldn’t overcome the water ingress. The five fishermen were rescued and evacuated to the shore. At the morning, the boat was half submerged in the sea south of Balbriggan, partially remaining above the water. Fishing quotas now mean that fishermen have to go out in bad weather to try to make a living, and this is the result, according to the local fishermen. The fishing vessel Atlantic Osprey has 400 liters of diesel and 30 liters of lube oil on board. The local authorities and environmental department is monitoring the partially submerged fishing ship and are ready to activate Fingal County Council’s Oil Pollution Response Plan if required. What was the actual cause of the accident and evacuation.